Print your book in Toronto! Self publishing is a collaborative service with the goal of bringing your work to life. We help clients self publish their research journals, novels, memoirs, and business communication materials. Our custom book printing service ships locally to Mississauga, Hamilton, London, Waterloo as well as to and nearby major cities in Canada including Ottawa, Winnipeg, Calgary, Montreal, and Vancouver. Have our specialists consult your communications project today. We’re experts in efficient, affordable and eco-friendly self publishing and are here to serve your publishing needs with a variety of online and offline publishing solutions. Publisher guidelines on setting up your book cover are posted here. Need your cover designed? Check out our paperback and ebook publishing cover samples on our graphic design page. We’re rated #1 in Toronto on Google. Click Here to Read our Reviews. The Ontario Book Publishing Tax Credit (OBPTC) is a refundable tax credit, based upon eligible Ontario pre-press, printing and marketing expenditures incurred by a qualifying Canada controlled corporation with respect to eligible book publishing activities, as well as expenses incurred after March 26, 2009 related to publishing an electronic or digital version of an eligible literary work. Details on Ontario Canada’s Book Printing & Publishing tax credit are available at this link. Custom Book Printing – What’s Your Story, Canada? TLAC helps Canadian authors self publish hard and softcover books in Toronto. Part of our printing proceeds support foundations of hope and hospitals in Toronto, your publishing matters here! Every month, we drop a cheque off at SickKids hospital, made out to Patient Care. We have no idea whose hospital bill we just paid! Publish your legacy into a beautiful softcover book that speaks volumes to your entire family. TLAC transforms your proofread manuscript into a polished high quality publication at a standard that your history deserves. TLAC’s memoir self-publishing service is Canada’s premiere memoir print publishing service. We look forward to working with you, so contact us today about self publishing your memoir. We are setup to produce short run productions of novels, business books, zines, and memoirs. A $350 setup fee may be applied to book production runs that are under 50 books. Our normal quantities for short run print publishing range from 50 to 2000 books. 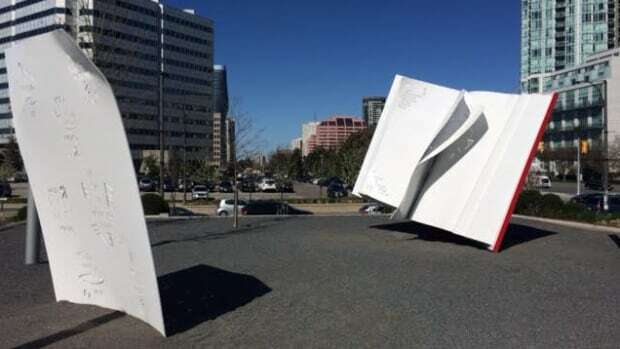 Giant Mississauga Book installed in Mississauga at Mississauga Celebration Square!